I did a favor for someone at work and in return they have graciously repaid me in ice cream. Being a fellow lover of food, she took the time to get some recommendations and came back with something I've actually had my eye on for awhile now. I was both impressed and excited for my lunchtime treat. 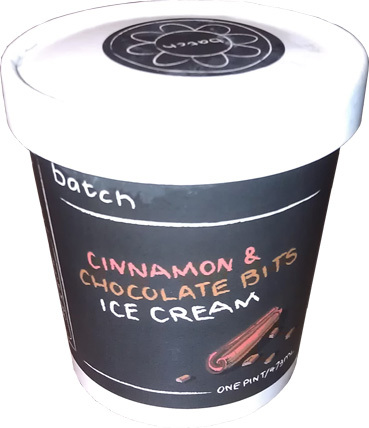 This is Batch Cinnamon & Chocolate Bits ice cream straight out of Jamaica Plain here in Massachusetts (JP is a Boston neighborhood). You can read the whole back story on their website, but basically they live by the idea of "made with real ingredients". The ingredient list on the back is short and the coolest part is that they actually use whole cinnamon sticks. but its actually chocolate & cinnamon bits in vanilla ice cream. surprisingly, there is just a hint of cinnamon aroma. I take my first bite and boom! I wasn't expecting that! It's got that dry cinnamon texture, as if licking some cinnamon I just spilled all over the counter. I take another bite and I have to say that this is definitely something I wasn't expecting. It's very different and I can imagine it would be off-putting to some. However, if you love putting a giant pile of cinnamon on top of your applesauce, then you will feel right at home here. Despite the grit, the cinnamon flavor is somewhat mild and by no means overbearing. Surprisingly the chocolate flavor is far in the distant background. I think I taste it, but I'm not 100% sure. The texture is really strange. I'd say it's the weirdest ice cream texture I've ever had, but then I started having flashbacks to the gritty Turkey Hill Pretzel ice cream. It may sound like I hate this one, but all previous comments aside, I do adore cinnamon and I am happily continuing my scooping of this ice cream. Like Howard Stern to every halfway decent act on America's Got Talent, I have to say this one is totally original and deserves to go on to Vegas. I continue on with my small scoops. You know, I'm now having flashbacks to Ben & Jerry's cinnamon bun ice cream. There are very few flavors out there that pay homage to cinnamon, and this one is going all out. You just can't help but appreciate the effort here. As I enjoy this intriguing treat, I realize that I would never know if this ice cream is icy or not because of the cinnamon texture. I know it's definitely not gummy like some cheezy frozen dairy dessert. The base seems soft and creamy enough, I just can't get a 100% fix on the smoothness here. Hmm, sounds like an excuse to try their other flavors. I don't think that I have crunched a single chocolate chip. They must be tiny. Wow, I am really on a different streak recently aren't I? Don't get me wrong, I like it, but I still envision people being thrown off by this one. You would expect cinnamon taste but get walloped by a million bits of cinnamon. You know, I need to consider the fact that the target audience is foodies here. Some little five year isn't going to walk by and go "oh boy, cinnamon sticks, let's get this ice cream!" (well, most 5 year olds anyway). 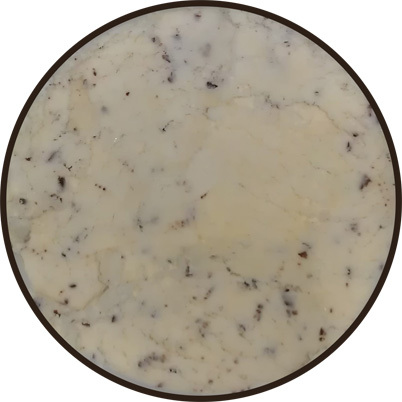 This is meant to be a very clean ice cream with a distinct taste for people with refined palets (not that I have one of those). Ok, time to stop. Live blogging is all done. The funny thing is I started my day with cinnamon too. I had a wonderful Cinnamon Crunch Bagel from Panera. Oh I do appreciate free bagel Fridays at work (free Dunkin Donut munchkin Thursday ain't too shabby either). I love cinnamon sugar, and when you cover the top of a bagel with it, well, it's just 420 calories of chewy heaven. I'm left with a faint but lingering flavor of cinnamon in my mouth... even 3 hours later I still think I taste a little fresh ground cinnamon. Ahhh, it's probably just my imagination. So if you live in Mass, give these guys a try. Cinnamon addicts like myself can grab this flavor, everyone else can grab one of six other flavors. Now that I know that Batch makes quality product, I have no trouble laying out the cash to try their other flavors. Dubba's P.S.A..: Remember kids, cinnamon makes everything better... except breathing. On Third Scoop: Honestly? Yeah, I'm bored of this one already, time to move on.